2mm high white plastic alphabets (All capitals) and numerals. 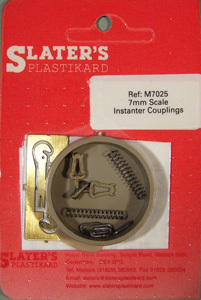 Pack of six self assembly sprung loco pickups. One pair of GWR Coach Vacuum Pipes for Non-Corridor vehicles. Cast brass with flexible wire hose. Can be used on any non-corridor vehicle irrespective of company. One pair of cast brass vacuum pipes with flexible hoses. One pair of cast brass steam heating pipes with flexible hoses. 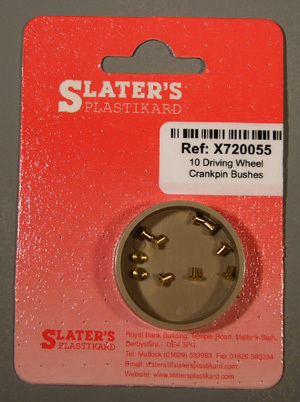 Set of six locomotive crankpins to fit Slaters driving wheels. Includes bushes, washers and nuts. 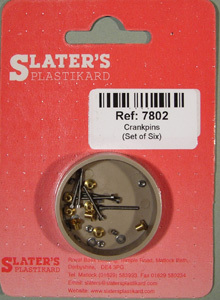 These crankpins are already included with Slaters driving wheels. 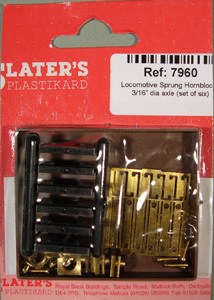 For outside cylider locos you may also need 7805 Crankpin Conversion Set. Etched brass. 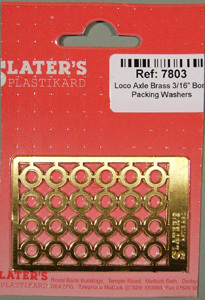 Three frets, each a different thickness, each containing 24 washers for 3/16in axles. 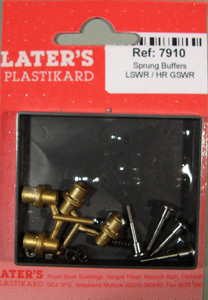 Pack of four sprung loco buffers. Turned steel heads, cast brass housings. 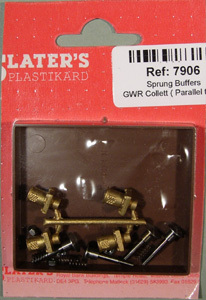 Pack of four sprung loco buffers. Turned steel heads, turned brass housings. 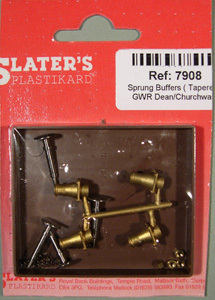 Pack of four Webb design sprung loco buffers. Turned steel heads, cast brass housings. 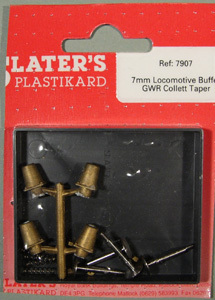 Pack of four sprung loco buffers. Turned steel heads, cast brass housings. Suitable for certain LBSCR Stroudley locos. 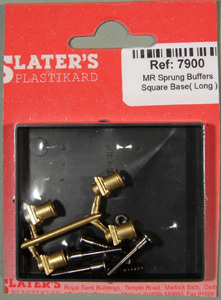 Pack of four 7mm scale/0 Gauge sprung locomotive buffers with steel heads and cast brass bodies. 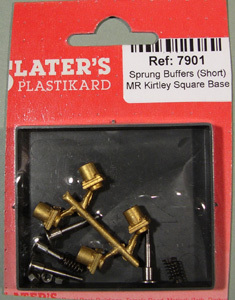 Set of six sprung hornblocks for 3/16in axles with cast brass guides. 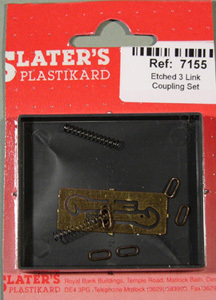 Previous version of this product shown! 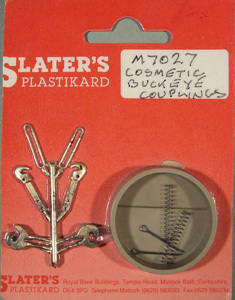 For plastic guides select Slaters 7960C. 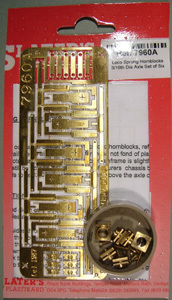 For etched brass guides select Roxey Mouldings 7A206 or 7A207. 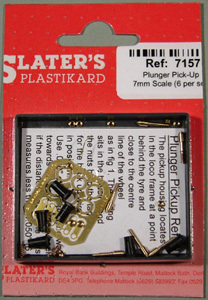 7mm scale lost wax cast brass. Total of four shackle chains for securing containers. One pair of self assembly screw-link couplings. They operate exactly like the prototype. 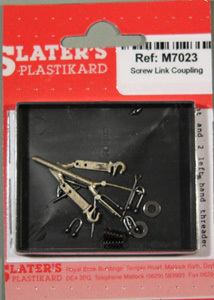 Ends of screw threads should be blocked to prevent self-disassembly! One pair self assembly couplings. One pair self assembly couplings with operational single link coupling. LMS/BR Brake Van Stove. A similar stove was often found in fogmen's huts near signals. Cast brass handbrake column and wheel for goods brake vans. Might suite some brake coaches as well. 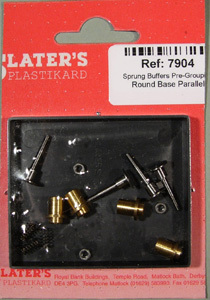 10 turned brass crankpin bushes. 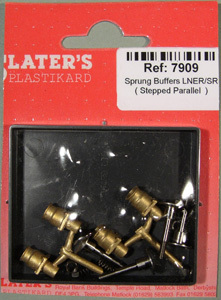 Allen key for Slaters standard 3/16" axles. 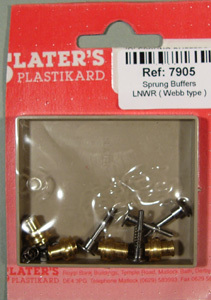 Allen key for Slaters 1/8" axles. Smaller loco driving wheels and extended axles. 0.035 Thou.